I live in Derbyshire, on the edge of the Peak District, and my studio looks North West towards the peaks. However, my roots are in Alderney, in the Channel Islands, and the sea is in my blood. A finished piece, for me, whether abstract or representative, has to be felt as well as seen. I want movement, light and atmosphere. That’s what inspires me in a painting: the portrayal of the experience of a place. 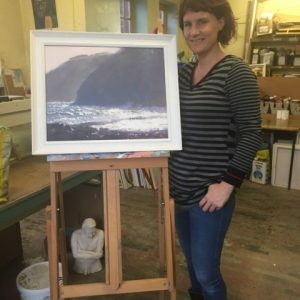 I work in acrylics and oils, both in the studio and direct from the landscape, and regularly travel to hold workshops and demos to societies, groups and individuals. I am also a guest writer for The Artist Magazine.